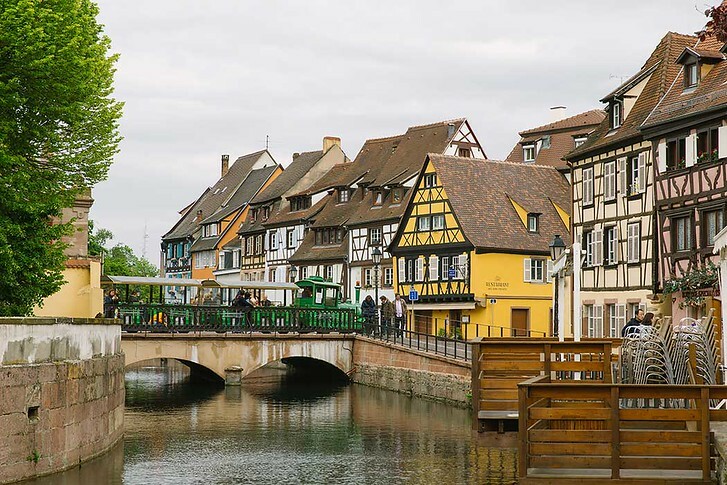 Is Colmar the Most Beautiful Small Town in France? 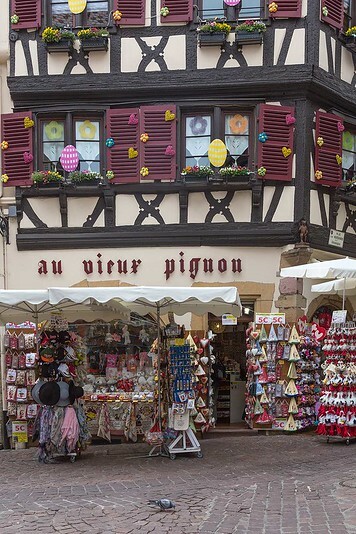 Out of all the stops on my Viking Rhine Getaway Cruise, I was most looking forward to our day trip to Colmar, France. Colmar is a small town located in France’s Alsace region, on the northeastern border near Germany and Switzerland. 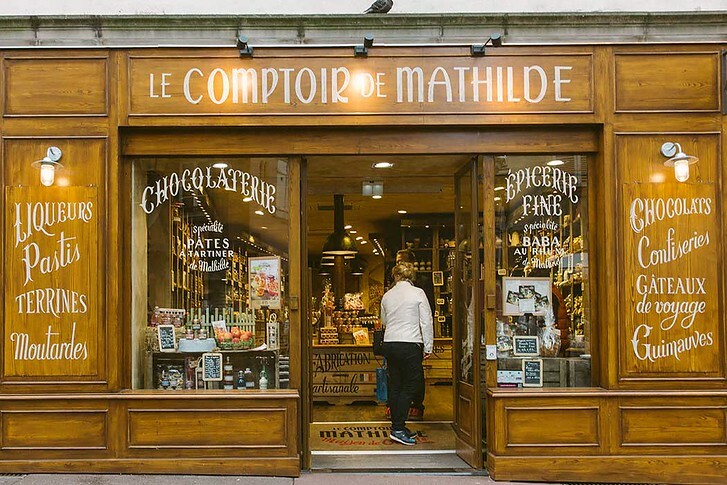 This adorable small French town looks like a preserved medieval village, with traditional half-timbered houses, an abundance of overflowing flower pots and uneven cobblestone streets. 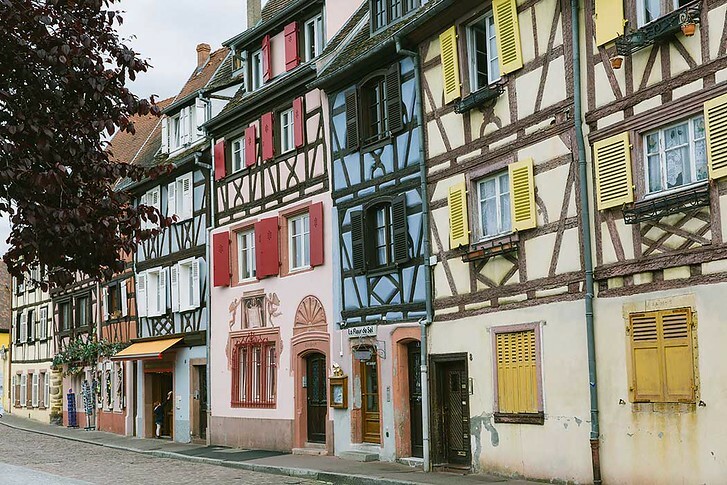 If you’re looking to explore the Alsace region, you have to start with fairy-tale Colmar! 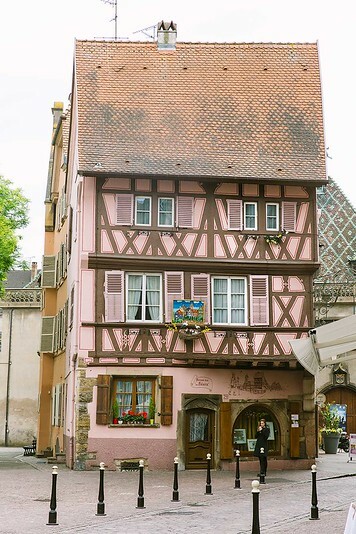 Keep reading for my Colmar travel guide, featuring lots of photos and some essential travel tips! French and German nationalism led each side to lay claim to the territories of Alsace and Lorraine. On the French side, France believed it ought to extend its territory to the country’s natural boundaries’. In the northeast, the Rhine River forms a natural divider between it and Germany and France was keen to lay claim to the territories on the western riverbank. As a result, Alsace was first conquered by Louis XIV in the 17th century with Lorraine subsequently annexed by Louis XV in the 18th century. Meanwhile, many of the local inhabitants still spoke various German dialects and identified as German. After Napoleon’s rise to power and French occupation of certain areas of Germany, a German nationalist movement sought to re-take all German-speaking populations of the former Holy Roman Empire to form a consolidated nation state. During World War I, France entered the fray with a major goal to retake Alsace-Lorraine while Hitler took full control of back in World War II. Today, the regions are part of France but the local people switch between German and French with ease. 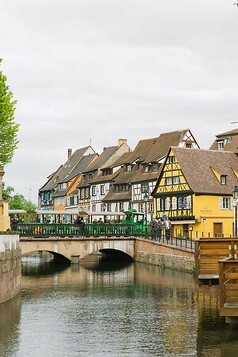 This is the spot in Colmar that everyone wants to see. It’s the guidebook photo and even more picturesque in person, if that’s possible! Little Venice is a series of different colored houses on a tiny canal – make sure to grab a view from the bridge at Quai de la Poissonerie (the fishmonger’s district) and also via boat! This history museum houses nearly 7,000 artifacts and cultural monuments of Alsatian history in a gorgeous Dominican convent dating back from the 13th century. Walk through the Romanesque and Gothic archways to find rich sculptures and paintings. The museum highlight is the Issenheim altarpiece, a colorful moving German painting depicting biblical scenes. This unique building caught my eye before I even knew what it was! 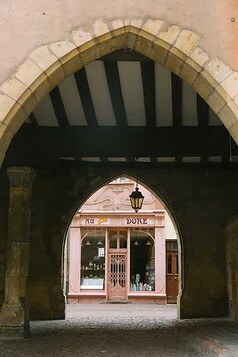 Built it 1537 for a local businessman, the medieval building stands out from the rest in this small French village due to its octagonal turret and wood gallery. It’s currently named after the family who restored it and lived there in the late 19th century. This gothic-style church was built in 1365 but due to fire and damage, has been restored many times. During touch up work, foundations dating as far back to the year 1000 were found. There are lots of antique shops to browse if you’re into that sort of thing! Overall, we saw lots of people strolling around the streets but Colmar never felt overly crowded. If you have more time, explore more of the Alsatian countryside! 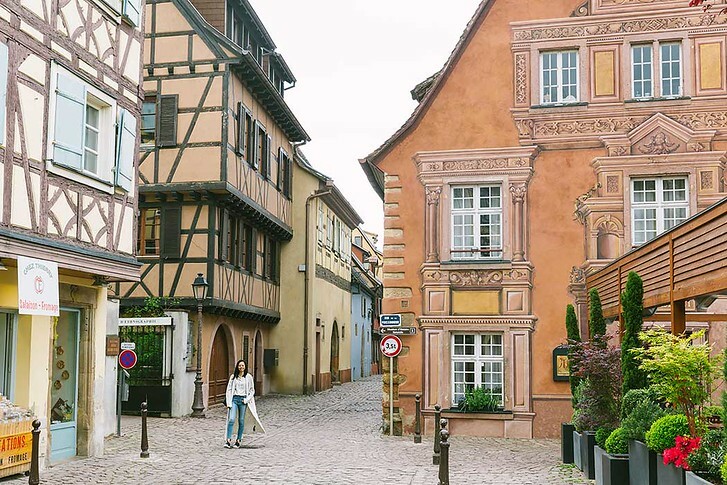 Near Colmar are many other beautiful small towns in France, including half-timbered, picturesque Eguisheim and fortified town Riquewihr. There’s also the medieval castle of Haut Koenigsbourg! You can view more tour options and rates here. The color each house is painted in once signified the family’s occupation. For example, blue for fisherman, yellow for bakers, green for farmers, white or tan for tanners. Apparently even farther back houses were painted just white or red to signify one’s faith. 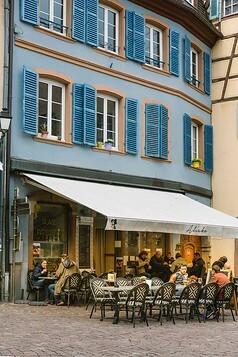 While in Colmar, make sure to try local gastronomic specialties and pair them with typical Alsatian wines on a full or half day wine tour. For example: Kougelhopf with a glass of Muscat, foie gras with Pinot gris. Also make sure to try Tarte Flambé (or Flammkuchen as it’s called in German). 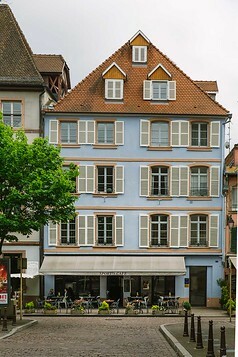 Colmar also has a number of Michelin starred restaurants to try! 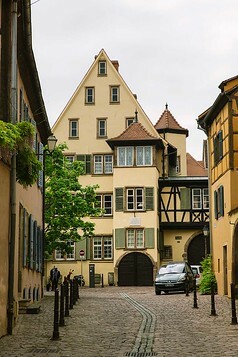 Colmar can be done in a day trip or an overnight stay. It’s one of those charming small towns in France where you enjoy the atmosphere and the picture postcard moments on every corner. For a day trip, budget at least 3 hours, but if you love food and wine I would budget an overnight stay if possible! 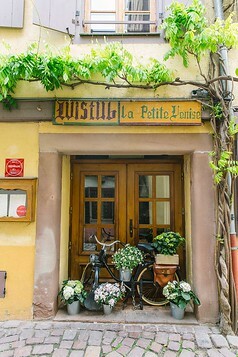 We recommend this classy hotel in the Old Town if you’re staying in Colmar overnight. Rooms have been recently renovated yet retain that gorgeous wooden-beam decor. Free wifi, clean beds! 2 | Hotel Le Colombier – This hotel boasts huge, modern rooms with king size beds. Great walking distance to local restaurants and everything in the Old Town. 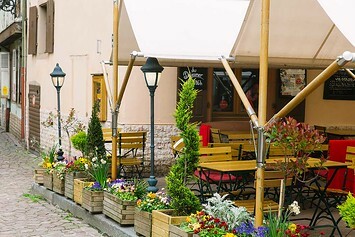 3 | James Boutique Hotel – This cute luxury hotel in Colmar is located right on the edge of the Old Town and within a 10 minute walk of Little Venice. Gorgeous, new decoration and recently renovated rooms make for a great stay! The easiest way to get in Colmar is by train. 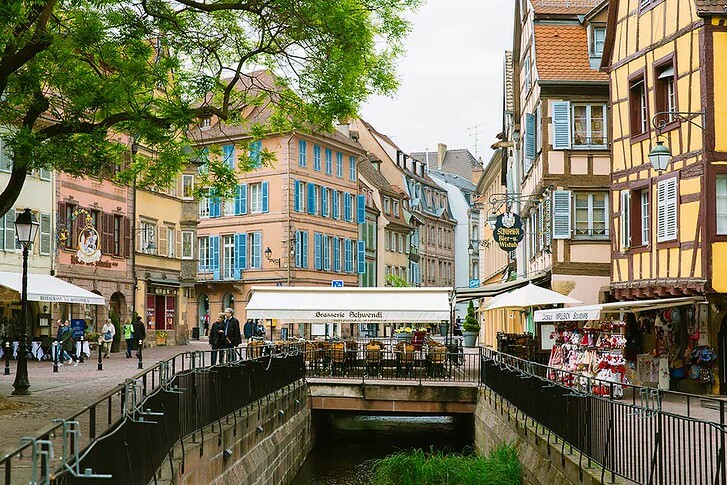 It’s approximately a 2.5 hour ride from Paris on the high speed train if you grab a direct, or you can change at Strasbourg and see that city as well. 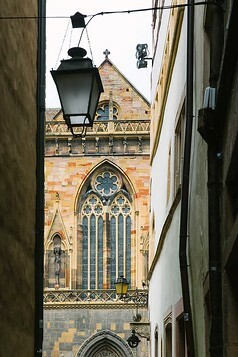 Strasbourg is very similar and like a larger, big-city version of Colmar. 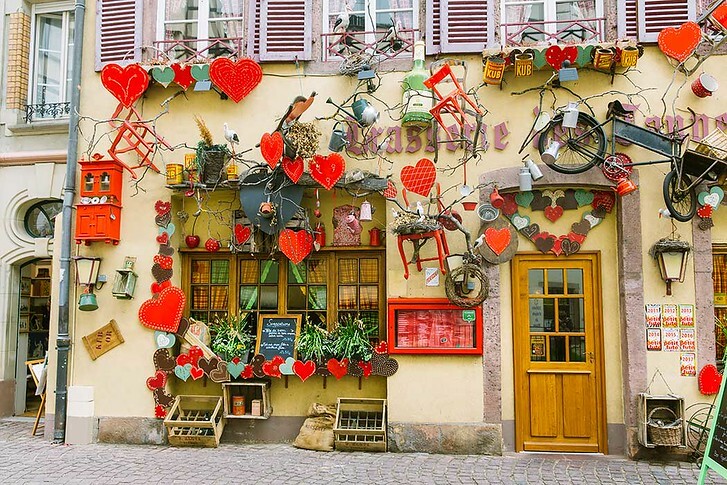 Once in Colmar, this small town is best explored on foot! 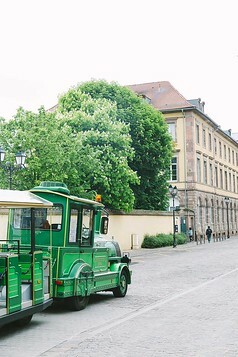 You can also take the the little green train for a circular ride around the Old Town, which makes for a fun experience. We really loved Colmar! Is it on your European bucket list? This really does look pretty. Your photos really make me want to go. Yes! They really are quite similar right? Like big / little siblings ha. 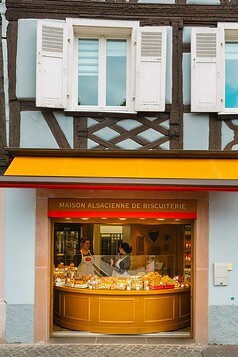 That reminds me, I need to write my post on Strasbourg!! Am about to go on a Viking Rhine cruise Basel to Amsterdam. 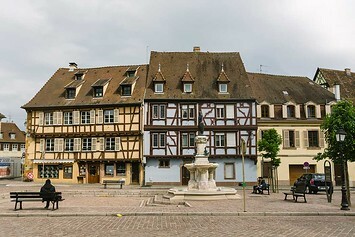 Our small group was considering visiting Colmar on our own. Did you find the guided tour worthwhile? How much time were you given afterwards to explore before you needed to head back to the boat? Great blog of your trip, btw. Hi Linda! Thanks, glad you found it helpful! For Colmar, I didn’t particularly want to stay with the guided tour group, so we did maybe 30 minutes with the group then let the guide know and she told us when to meet the group for departure. we explored the town on our own, it’s really walkable and even without a map you won’t get lost. You could do that if you like! I want to say in total, the group had roughly 3 hours in Colmar? For us it was enough time! In your post about Rhine River Castles & Koblenz, you mentioned some of the other guest opted for the dinner excursion but you don’t mention which one. The Wine Tasting in the Castle or the RÜDESHEIM? We were thinking about booking RÜDESHEIM? Also is it necessary to go on the paid excursion to the Cathedral in Strasbourgh or did you do the free walking tour and visit the cathedral on your own? What I found on the internet tickets look to be about 6 or 7 euro. Hi Lisa – It was the castle dinner + wine tasting that they raved about. For Strasbourg, yes the included tour in the morning takes you to the cathedral and you get to go inside. The optional tour is if you wish to go to the top, which has a separate fee. I’m not sure how much the Viking optional is but I assume they include a guide. We did have free time to explore the city after the morning tour, so you could always go to the top of the church on your own and pay just the ticket price. Koblenz is another city with a famous cathedral that you can pay to see the top. My architecture t is beautiful, but I really felt uncomfortable there. We made a photo of a beautiful administrative building and the guard was very impolite and ordered us to delete the photo. He wouldn’t leave us alone until we did that. That never happened to me the many years I lived in Germany and traveled around Europe. I am a very polite person, never take photos inside museums, cathedrals etc. We avoided speaking Croatian after that (it might sound Russian to them, I have no idea) and switched to German for the rest of the day. There was also a lot of police around the city and other people had weird experiences in the bus with passport control upon entering the bus or with controlling their luggage. I personally had no problems with that, but left a feeling that the town was hostile and not welcoming. In short, it is highly likely that you will have some kind of bad experience if you are a foreigner and you should be extra cautious and prepared. Personally, I would never go back there or to any other small town in France.